March 13, 2018--Found a ready made frame for this letter. Not sure what I'm going to do with it, so maybe a friend with a name beginning with N will want it. It's very pretty in person. 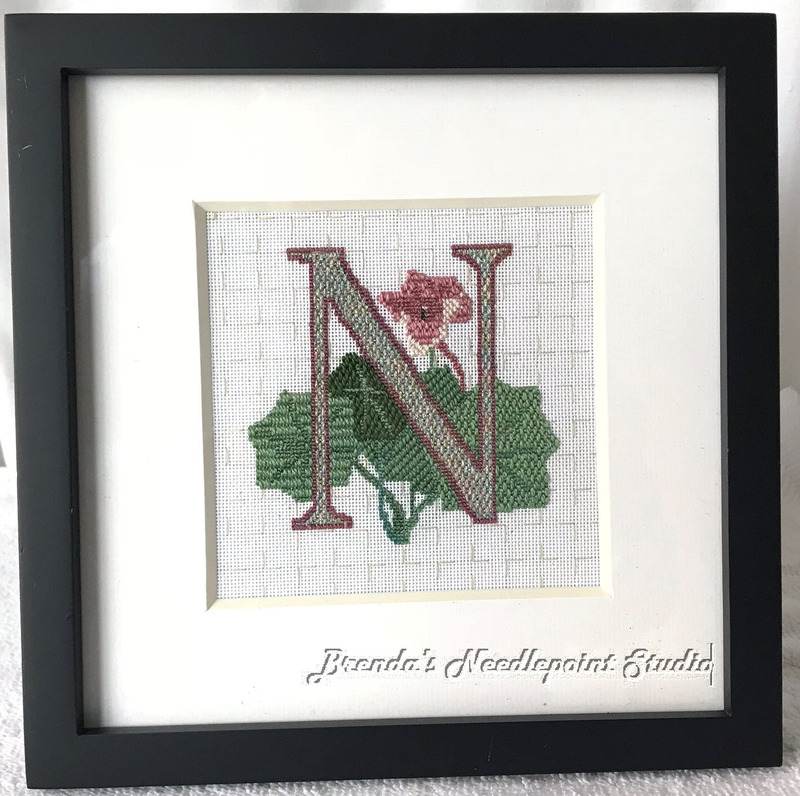 October 10, 2015--Sometime in mid-August, Liz Morrow sent out an email searching for pilot stitchers for her Gardener's Alphabet project (counted stitch, not painted) described below. I've admired Liz's work with bargello and jumped at the opportunity to do this. Here's the end result* and more information follows. The Garden Alphabet was designed by Jim Williams as a rug. The designs were first published in Needlepoint News, Jan/Feb 1982 issue. At that time, it was worked on 10-count canvas with Paternayan wool in Tent stitches. Mr. Williams has graciously allowed the designs to be reworked for 18-count canvas, color coded to DMC floss. The designs may be worked entirely in Basketweave or Continental. If desired, decorative stitches may be used, particularly for the background and letters. The background could also be left unstitched, especially if a colored canvas is used. A light coverage stitch on a colored canvas is also an attractive option. Liz sent me the letter N to stitch, using the canvas, colors, threads and stitches of my choice. I have to admit that I have very little experience in choosing my own stitches, but tried to keep the different areas uniform in size while giving contrast. I did something very unusual though (at least for me it’s unusual)—all the stitches are vertical on 24 count congress cloth—there aren’t any diagonal or horizontal stitches on the piece. The color choices were based on the Kreinik thread used for the letter. I love this color called Confetti Pink and it works with the flower and leaves. Also, for the background, the basting stitches, worked over 5 threads in blocks of ten, were left in place. I thought it gave a nice trellis-like look to it. If I had more time (this needed to be done by the end of September), I would have redone this project, using threads with more contrast for the flower and a darker thread for the veins of the two center leaves. Also, because the spaces within the flower were so small, would have chosen different stitches. Oh well, for the most part it worked and Liz is going to use it. * Liz has approved this early blog about the project and hopes to have the full alphabet up on her web site by the end of October. Can't wait to see what the other stitchers have done. Still hoping for end of Oct publishing date. Fingers crossed! Love your stitches for your letter "H". Keeping fingers crossed for a late October publishing. You did a great job. Very pretty. I was so surprised to see this today! Your letter looks lovely framed. I hope you find an N-person who will enjoy it! Hi Liz. I really love this letter and have decided to keep it. Will hang it in my craft room and tell people the letter N stands for Needlepoint. Of course! LOL.